Cancer Biology: SmartMeters, a source of cancer? According to an article in the San Jose Mercury News the instillation of SmartMeters has raised health concerns among many residents in California, 31 cities have written official letters to representatives in initiation of a ban. These residents are skeptical about the radiation emitted from the device and believe it may significantly increase the risk of cancer. A little information about the device before we go further into the investigation on this concern-SmartMeters, an innovation introduced by PG&E to replace analog meters, is intended to improve energy usage and reliability of safety for costumers. The goal is to create a “home area network” which will transmit wireless information about the energy usage of major appliances, monitor natural gas use, send energy alerts through email, text or phone to locate customers with power outages and encourage low-energy usage, and possibly even enable costumers to activate their alarm system with their cell phones. The SmartMeter is serving as a high-tech energy management tool for customers to conceptualize an effective plan before a bill is received. However, along with any other advancement in technology there are repercussions that are not considered in the excitement of an innovative tool. 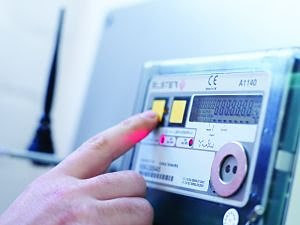 SmartMeters are a source of low-energy electromagnetic radiation, with a radiofrequency equivalent of 1-watt night light. These devices emit miniscule amounts of electromagnetic radiation in comparison to devices that never leave our side: cell phones. In fact a collaboration analysis paper of SmartMeters, between three communication-electric companies, claims that “a radiation frequency exposure comparison of a person talking on a cell phone and a person 3 and 10 feet from a continuously operating SmartMeter would result in SmartMeter radio frequency exposure of 125 to 1250 times less than the cell phone.” If this is the case, then why are residents concerned? So now that there is a connection between SmartMeters and health risks, how does this relate to cancer? Are the residents’ concerns of cancer valid? Future studies are needed to compare the radiation exposure from cell phones and SmartMeters. However analysis of other studies that investigate connection between cancer and low-energy electro-magnetic frequency may provide insight on this issue. Radiofrequency radiation is believed to not affect genetic alterations in some studies, while other studies claim radiofrequency radiation induces cancer. Conflicting information about modification of gene transcription and protein levels at the cellular level and in animal models render lack of consistency. This effect shows no clear conclusion about how radiofrequency radiation affects/ does not affect our health. However, the possibility of a radiofrequency-radiation-induced alteration of a gene expression or protein translation indicates the need for further research. Until more data can be compiled one article concludes, "lifestyle, diet, genetic factors and improved healthcare have a far more significant effect overall on human health than hypothetical risks such as RFR (radiofrequency radiation)." Therefore, whether residents decide to opt out of the SmartMeter program or not is dependent on how one views life. Should they abide by the proverb “the best defense is a good offense” or should they live according to immediate health risks?